By Daniel Horowitz--On a day that culminated with fireworks lighting up the night sky, United Jewish Appeal’s 45th annual Walk with Israel started Victoria Day off with a bang, as more than 15,000 men, women and children took part in the celebration, which had downtown Toronto awash in blue, white and red. 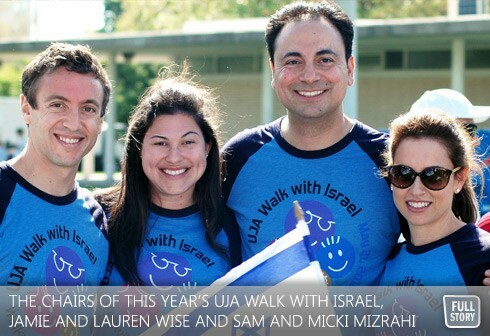 And, thanks to the sponsored walkers, this year’s Walk with Israel – chaired by husband and wife teams Jamie and Lauren Wise and Sam and Micki Mizrahi - has already raised more than $600,000 – a record total - which will go towards transforming the lives of men, women and children living in vulnerable Israeli cities such as Sderot, Eilat/Eilot and Bat Yam. “UJA’s Walk with Israel perfectly encapsulates the strength of our relationship with our Jewish homeland,” Elizabeth Wolfe, Chair, UJA Federation Board, told participants prior to the start of the Walk, which left Coronation Park, and ended at Ontario Place with the spectacular Irwin & Renee Nadal Festival. “As a Jew and a Canadian, it fills me with pride to see thousands of us walk through the streets of our city, waving our Israeli and Canadian flags, and showing the world that as Jews, and as Canadians, we will eternally stand with Israel. Well before the establishment of our Jewish homeland, Jewish Toronto has shared an indestructible bond with the state, and the people, of Israel. “Over 15,000 members of Jewish Toronto showed their love for, and solidarity, with Israel yesterday at UJA’s Walk with Israel, and what an incredible day it was for our community,” said UJA Federation President & CEO, Ted Sokolsky.